The Altarpiece project is not finished, and I need to get back to finishing this piece. I gave the doors another coat of gold paint this morning. This week I need to work on the inside of the doors. We shall see if it is accepted in the Clifton Cultural Arts Center's juried Golden Ticket Art Show later this year. Will the judges consider the outside of the doors, the inside of the doors and large painting on the inside? Political satire doesn't win many friends where there is little or no humor. So, we shall see what happens later this year. I wonder if I should enter this piece under my Italian name as I was known in 15th century Italy? The Altarpiece: Mother & Child with Level Playing Field Out The Window from the workshop of Frederico da Vidi. 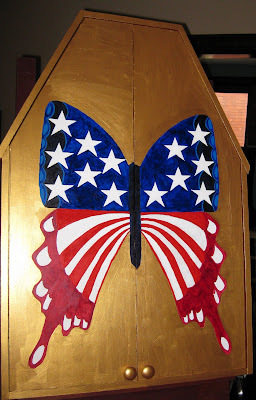 The doors: acrylic paint on birch covered plywood, 2011.